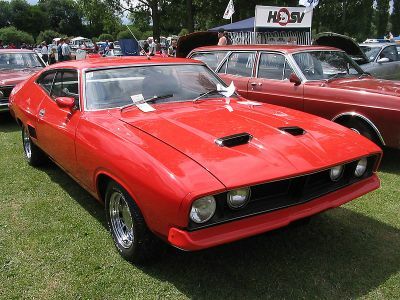 Ken’s XB Falcon 500 coupe was imported in February, 2003 by Heath, another of our members. Heath had tracked the car down through a good friend who had emigrated to Adelaide. 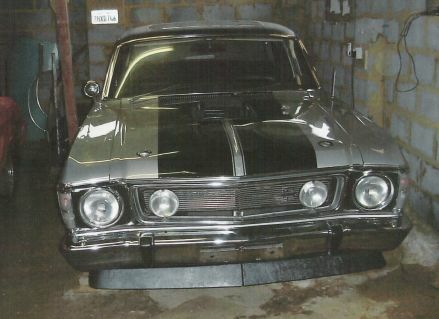 While out visiting his friend two years ago, Heath had looked for a car to buy but was unsuccessful, but, in October, 2002, while surfing the web he found this car for sale, and close to his friend too. The car was viewed and purchased and Heath arranged for the car to be shipped to the U.K. 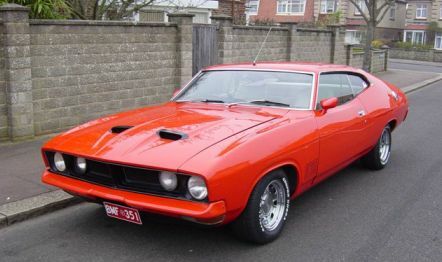 The car is an XB Falcon 500 that has been painted to represent an XB GT351. It has a 351ci Cleveland engine, FMX automatic transmission, limited slip axle and four wheel disk brakes. 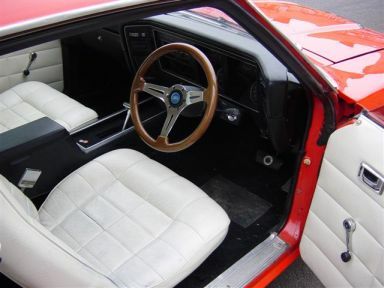 The white interior is in perfect condition. Ken has many years of experience with Australian cars in this country, owning a number of Australian Chargers, and an XW GT clone. 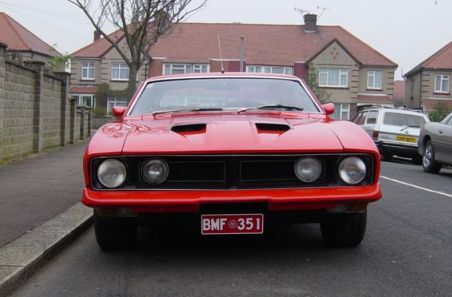 He has purchased many bits for the XB through ebay in Australia, including new XB GT style flutes and the hard to get rear honeycomb panel above the tail-lights. 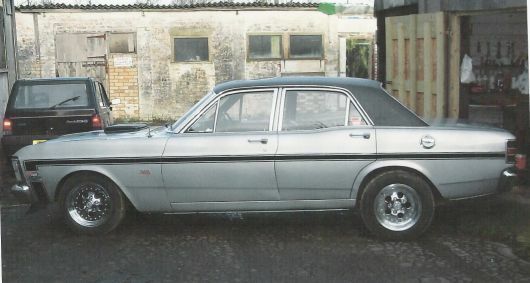 Here are some photos and information about Ken’s XW GT clone. Ken has owned the car for about 15 years now. 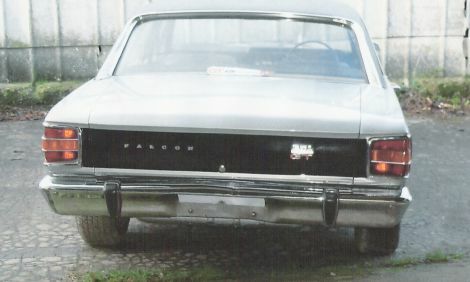 Originally the car was a 1970 XW Fairmont with a 302ci Windsor V8 and an FMX automatic. 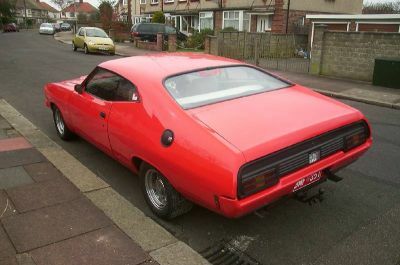 However, not long after buying, Ken discovered the history of the Falcon GTs and decided to build a replica. He was extremely fortunate to discover the delights of Ford GT Performance and the expertise of Dave Frake, its owner, who supplied Ken with all the parts to turn the car into a GT. 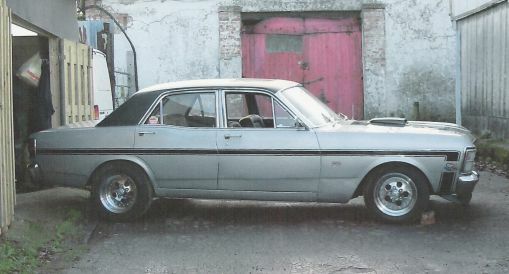 Now featuring an American spec 351ci Cleveland, it backs this up with a four speed Top Loader gearbox. The car has been on the back burner for a number of years, but could be back on the road with a minimum of work. It even still features it’s original paint. The car was personally imported here in 1977, and came from Victoria in Australia. I wonder if the original owner ever thought it would end up half way around the world as a romping, stomping GT. As for the XY shaker ? As Ken says, it had to be done.